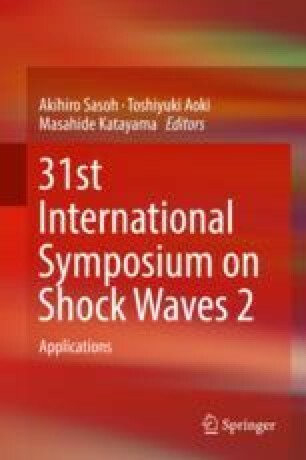 The problem of planar shock wave–dense particle cloud interaction is solved using two approaches. In the first one, the two-dimensional gas dynamics modeling of the interaction of the planar shock wave with Mach number 1.67 with the set of cylinders is carried out. The original author’s numerical algorithm of the Cartesian grid method is used. The set of cylinders models the dense particles cloud with the volume fraction 0.15. As a result of interaction, the collective reflected and transmitted waves are formed. In the second approach, the one-dimensional system of equations for the description of the dense two-phase flows is solved. Results of one-dimensional modeling are matched with the cross-section averaged pressure distribution from the two-dimensional calculation. The quantitative agreement is achieved. The specific features of the process are discussed. We formulate the idea of complex approach to the investigation of the shock wave–dense particle cloud interaction that is based on the getting of the drag coefficient of the particles bed from the results of the multidimensional calculations and the comparison of those results with the calculation using the two-phase model.